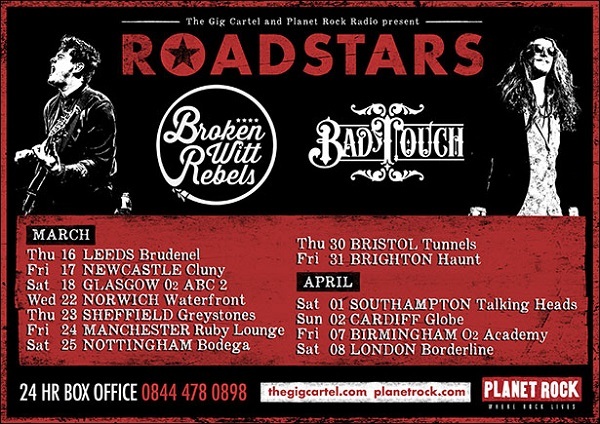 Birmingham’s award winning 4-piece, Broken Witt Rebels will be touring with Norfolk’s Southern rock band Bad Touch - two of the most exciting new prospects in the UK blues rock music scene embark on a co-headline 13-date UK tour in March and April 2017. Tickets for the tour, priced £14, go on sale on Tuesday 6th December from the 24 hour box office 0844 478 0898 and http://bit.ly/1U8gW0W. Broken Witt Rebels experienced success in 2016 with the release of their 5-track EP featuring the singles “Low” and “Guns” which received airplay on Planet Rock and XS Manchester, while “Low” was Track of the Week on Radio X. The music video for “Guns” attracted 464,000 views. On October 27th, they won “Best Rock Act” at the first annual Unsigned Music Awards held at The Troxy in London, and closed the Awards by performing “Guns”. BWR were also nominated for “Best Live Act”. Bad Touch are a 5-piece rock band from Norfolk, who recently supported the Kentucky Headhunters on their critically acclaimed sell-out UK tour. They recently released their second studio album “Truth Be Told” on Bad Touch Records on Friday 2nd December 2016, and supported Whiskey Myers at their sold out concert at The Dome in London. Their new album features the singles “99%” and “Made To Break”, both remixed for radio by the legendary Rolling Stones engineer and co-producer, Chris Kimsey.